As of 2018, sixteen percent of Americans owned a smart speaker, and twenty percent of Google queries were voice searches. As voice technology and digital audio have risen in prominence, VaynerMedia has invested in these channels and made them a priority focus for the agency and our clients. With the goal of educating brand marketers on the opportunities within voice and digital audio and teaching them how to begin marketing within these channels, we created VoiceCon. VoiceCon is a VaynerMedia owned and operated event and in 2018 it was held in the IAC Building in New York, NY, that taught brand marketers, digital agencies, and tech companies how to leverage Voice and Digital Audio to accomplish their business goals. 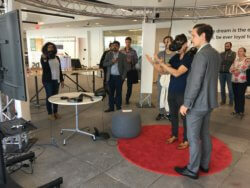 The full three-day event, which took place May 21-23, 2018, included an intimate VIP Dinner hosted by Gary Vaynerchuk, the one-day VoiceCon conference, and a VoiceCon Tech Tour, where attendees toured leaders in the Voice and Digital Audio space in New York City and participated in workshops and guided tours. The conference attracted over 400 attendees from across the world for a day packed with keynotes and panels featuring today’s leading brand marketers, including Amazon, Google, JPMorgan Chase, SAP, and more.